Walk, bike, drive, fly, carpool, take the train or bus, just get your buns down to Eugene, specifically Hutch’s Bicycles at Charnelton and 10th (by the downtown library) on March 6th from 5:30-9:00 p.m. and you can get yourself, among a slew of great offers, 15% off Bike Fridays!!! In addition to that, you’ll be able to check out some of the finest manufacturers of bicycles and bicycle accessories in the Northwest, including Chris King, Burley, Co-Motion, Rolf, Castelli, Detours, Redline, Yakima, and Showers Pass. The local bicycle club, GEARs (run by our very own Paul) will be there, as will Lee Shoemaker, representing the city of Eugene, and one of two certified bicycle schools in the country, from Ashland, Oregon, the United Bicycle Institute. William L. Sullivan, author of THE BEST guidebooks about the wonderful state of Oregon, will be there as Oregon Adventures. I’m still bummed I missed his workshop on car free recreation at the Eugene Walking/Biking Summit. Music will be provided by Skip Jones, a local boogie piano man, who calls on the likes of Otis Spann, Professor Longhair, Dr. John, Fats Domino, Leon Russell, and James Booker for inspiration. Ought to keep it lively. You can meet the mayor of Eugene, Kitty Piercy, who has pushed through resistance from the community (which, despite its hippie/anarchist reputation, is surprisingly about half right-wing) to try to make Eugene a more fun, sustainable, livable space. She deserves your thanks as it much of our success can be attributed to her support. There’ll be door prizes and contests. They’ve got wine tastings, too! All of this is free! Seriously, this cannot be missed. Mike and I should be there to represent Bike Friday so come say hi! The word for stitches or tricks in Finland. The London company that provides IT consulting to legal and accounting firms. These are the nasty folks that stole our domain name! Boycott them now! The Massachusetts record label Northeast, which once labeled itself Tikit (thanks, Malcolm). First person to take their Bike Friday tikit to all of the above locations will get a special prize. By the way, the other Bike Friday continues to get tons of press, yet I don’t think I’ve heard of a Bike Friday bike on a Bike Friday ride. Another prize for the first one of those. Lastly, how about a third prize to anyone that sneaks their Pocket Crusoe onto the set of the new TV series Crusoe. That ought to get us some good stories! Bike Friday has been alive with activity lately, so much so that this blog is a nagging memory every now and then while I ride to get to work, so I can in turn work like crazy and then finally get to ride home into the sun to my beautiful family. Needless to say, things have been good. We had a nice vacation on the beach in Newport. We flew kites in a state wayside right down from our hotel that thanks to knowing the right people was less than it costs to stay in the Motel 6 on the freeway here in Eugene. We didn’t do much of anything. That was a nice change of pace. After which, Bike Friday went to the Oregon Country Fair in custom-built (folding, too!) tie dyed polo shirts and showed off the bikes. We showed Ted White‘s classic “Return Of The Scorcher,” a movie that’s not only well known for showcasing bike culture around the world (read: see it if you haven’t!) but also for inspiriting the first Critical Mass (and also much less so for including a little interview with Kash, who runs our SF tikit agent Warm Planet, as he washes some underwear on tour). We made a whole skit out of it, explaining that our power source wasn’t working and that we’d need to bring in the back-up ROB unit. As it turns out, the “ROB unit” was Rob English, fastest British man and 7th fastest in the world according to the hour record, atop Hanz’s desk which is entirely pedal powered. He was all decked out in a huge Union Jack in the form of full-on time trial gear. Anyways, it was a blast, but we didn’t get to camp because the Fair’s weird like that. I guess. The girls left me last weekend and I went to Paul‘s well-named “No Car Party” as well as the even better-named “Kidical Mass.” The latter really sticks into my memory because it was a heck of a lot of fun on bikes. I’ve appeared at a Critical Mass or two and kind of like it. The police reaction to it I don’t like. But Kidical Mass was none of that. Just a family-friendly group touring about the neighborhood with the kids, enjoying the ride and following the traffic laws along the way. It was not like we were blocking traffic (yes, yes, I know, “we are traffic”), but it was like the other traffic didn’t exist. We went down to the Whiteaker Neighborhood River Festival I didn’t even know existed and then rode all over. Then they were playing “Labryinth” at the park and the plan was to go to Laughing Planet beforehand but I thought the dog might miss me. In the Bike Friday front, we’ve never had a July like this. Usually things start slowing down now. They’re ramping up. In other news the tikit line hit a real milestone in production today, being a sure sign of the ease at which we’ll be able to keep up with the increased desire for transportation solutions. Season tikit? Yeah, it’s pretty much ready. We’ve got a blinged-out fiber Express tikit in the showroom we’ve been calling the Carbon tikit. Kind of like a carbon credit, but much more useful for getting the groceries. I’ve just been riding (actually so has Sierra, both on the Tug-a-bug and on her own Bantam NWT) and hope that I’ll take the Pocket Llama to Cycle Oregon Weekend and the tikit to the Bridge Pedal. The 54×15 will be perfect. Hope to see you there! In honor of the Last Friday Artwalk (the much better of the two in Eugene) as well as Critical Mass, I propose we change the name of our most ridiculously-category to “Bike Friday Fabulous First/Final Friday Fixed Gears.” There will be one every month or else! Lastly, go see/hear Panasonic‘s new release if you haven’t. Yes, I know they’re now called Pan Sonic because of that silly electronics company, but I still remember them at Panasonic when I saw them play with Merzbow and Masonna. Indeed, that was probably the most memorable show of my life. Their cold, mechanical, form of minimal techno is unlike anything else, all pink-noise and square-wave. The latest is another live set, just brimming with raw, powerful energy, like a technology-current Esplendor Geométrico. I just wish it were a LOT louder. Just put it on headphones in the dark on turn to tracks 8 until the end to feel the full frontal force. On the same trip, 1/2 of the aforementioned, aka Mika Vainio, who usually seems to have more in common with minimal glitch composers like Ryoji Ikeda or Alva Noto than anything else, also put out a great album called Oleva under his ∅ alias that even has a cover of Pink Floyd‘s “Set The Controls For The Heart Of The Sun” to rival Psychic TV‘s. It’s dark, throbbing, almost ambient at times and highly recommended. What’s new in ya’ll’s world? A customer of mine instant messaged me the other day, all excited to discover that Sheldon Brown was on a Bike Friday. Sadly, a close inspection of the picture and his website revealed that it was just another one of his Raleigh Twenties, which he claims “with suitable equipment […] can approach the performance of a Bike Friday at a much lower price.” While I have my doubts about that, I can say that Sheldon Brown has a nearly encyclopedic website about bike-everything. He’s got some quirky ideas and likes Biopace but he is a fellow fixed gear freak and is familiar with just about every obscure component known to man, even French ones. If there’s a piece of info you need about bikes, it’s probably on his website. 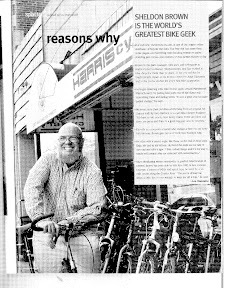 He’s made little Harris Cyclery on the map because of his overwhelming bike lust and constant presence over all the bike-related spheres on the Internet. The online store is very impressive and makes getting lots of hard-to-find parts easy. Heck, you can even special order through them care of big time distributor Quality Bicycle Parts. And all this is because of Sheldon’s computer savvy & passion for cycles. The bad news is that though neither of these interests have waned for Sheldon, his ability to enjoy the latter has. I was shocked to see a post on the fixed gear mailing list saying that he would not be participating in the Interbike demo because he could not ride. He provided a link to his journal that included comments about MRIs and not be stable on the bike. Looking deeper, he’s got a page specifically to monitor the progress of his health issues. It seems the latest is that he cannot ride anything besides a Greenspeed trike and even that’s a little shaky. It seems that he has developed the very rare and mostly untreatable primary-progressive version of Multiple Sclerosis. There’s currently not too much hope for slowing it or stopping it. It’s almost that same grim prognosis that Lance Armstrong was given so long ago.. almost. In any case, Lance rallied the troops together to get the support he needed to beat it. Why can’t we do the same thing for this equally important luminary of the bike industry? First off, send Sheldon your love and best wishes. If you have extra money, donate to the MS Society. If you don’t, consider becoming a rider in the MS Bike Tour (which is in nearly every state) and work hard to raise funds for the Society. This will provide the money necessary to do the research to find a treatment for this debilitating disease. And hopefully we can get Sheldon fixed again. No pun intended. I am simply appalled at what I saw in the newspapers today. Here’s the deal: I don’t read the newspaper all that much. So for me to glance at it randomly and see the same subject in both papers makes me wonder how bad it really is. Oh, the subject? Oil addition. Bike Friday owner Katie Alvord wrote an incredibly well-researched history of how the automobile (called Divorce Your Car! which you can buy on the Bike Friday store) came to dominate our streets and, concurrently, how we ultimately got the first taste of the life-wasting drug that is oil. The oil crisis of the 70s was not unlike that part in The Basketball Diaries where Reggie saves down-and-out just-hit-rock-bottom heroin junkie Jim Carroll but makes the mistake of leaving him alone in his apartment. He rummages around, finds some money, goes back out and gets another fix. For Jim there ultimately was a resolution, and though I want to believe there will be one for America, I have my doubts. When I see stretch Hummer limos and people unwilling to even concieve of life without a car, it just makes me worried, despite how many more people I see riding bikes, taking the bus, developing alternative transportation technology, and at least trying to be carlite. On the positive side, there’s even a Republican (you know, those guys that always get blamed for all the wrong doings in the world) defending the plight of fixed gears in Oregon when he could have easily spent his time subsidising oil or something. However, the headlines today definately left a bad taste in my mouth. The skinny on this is that there are these four guys that work for the feds auditing leases for oil and gas on government property. They caught some instances where a few companies, Shell and Kerr-McGee among them, had cheated the government out of money. We’re talking $30 million worth. Well, it turns out their bosses told them not to bother investigating. So basically, we’re giving these guys money in the form of subsidies and then turning a blind eye when we discover they’re robbing us, too. Nice. Gotta have those cars. Click on that link above and look at the trend. It’s absolutely nuts. What’s also crazy is that even when he pulled people together for the war on terror, which increased his ratings, it was short lived because the war itself raised oil prices. All in all people are essentially forming their opinions on politics based on oil. How crazy is that? Are we really so entrenched in this addiction that we cannot see another way to live? If having gas was so important, how did we survive for so many years without it? Why does it seem that people are turning a blind eye to the fact that eventually, perhaps soon, we’re not going to have oil? I really think we’ve become just like a heroin addict: completely devastated, unaware, and unable to break free from the cycle of compulsion. By the way, tomorrow is World Car Free Day. Wake up and smell the fumes! It’s time to ride your bike!! Oregon is an idyllic place to be a cyclist. First, the scenery is impeccable. Whether you like volcanoes, pristine lakes, wild rivers, mountains, ocean, desert, or subtropical rainforest, you got it in Oregon. Secondly, in just about every metropolitan area, including Portland, Salem, Eugene, and Corvallis, there are bike lanes and bike paths and signs alerting motorists of the presence of bicycles. Where these things do not exist, there are usually wide shoulders and low traffic, not to mention plenty of wilderness roads and logging roads, some of them smoothly paved and covered over in cooling trees. And then, of course, there are all the mountain biking trails. There are four bicycle manufacturers in Eugene alone (not to mention a fifth bike industry business, a wheelbuilder). There are some more manufacturers outside of Eugene as well, some notable names being the one-man fine-art-on-two-wheels business known as Vanilla, obsessive compulsive machinist Chris King (whose headsets I consider a requirement on any Bike Friday), and titanium mountain bike design wizard Jeff Jones. And then there’s all the other great bike businesses. In Southern Oregon is one of the few schools you can get accredited in bicycle mechanics, frame building, and bike shop management. They also have what I think is the state’s only bicycle parts and tool distribution. There are a plethora of great co-ops like City Bikes in Portland. And then there’s some exceptional things like the Center for Appropriate Transport that teaches at-risk youth skills in delivery, journalism, mechanics, and manufacturing. And don’t forget their ridable bike museum and rentable shop space! There is a community of bicycle advocates, fighting to give cyclists more rights, even in elected office, such as Senator Ron Wyden, Congressman Earl Blumenauer and Representative Peter DeFazio. All across the state, if you get a driver’s license, you’re going to learn that bicycles are legally afforded a position on the road. The Oregon Driver’s Manual mentions bikes over 50 times, so it’s no faint suggestion, either. Don’t forget about the clubs and events to be a part of, too. The aforementioned Cycle Oregon has a reputation for picking the best routes, having the best food and further offering additional services to pamper their guests while taking them camping in what are often remote parts of Oregon. Despite this, though, it’s difficult to limit all obstacles to cycling. Especially when the cost of oil is skyrocketing, it’s difficult not to feel a little animosity towards the people who have already figured out a healthy solution to the problem. 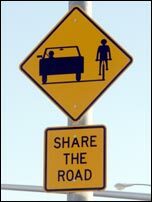 This was the case for this year’s Cycle Oregon Weekend as they were assaulted with tacks and anti-cycling signs. This comes at a time when Portland is abuzz with concern over some potentially inflammatory statements made towards cyclists on a local radio station. photo: rcoder under cc license. 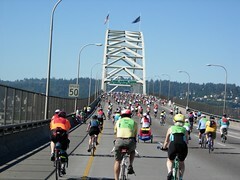 The Providence Bridge Pedal is an amazing ride. Thousands of cyclists (2nd largest cycling event in the country!!) come to Portland, Oregon, to ride the bridges that made it famous. Every one of them. Even the Fremont, which you see here, which leads eventually to Interstate 5 itself! The whole thing is all yours. Amazing. Will not miss this year. I know Gaylynn is also planning on going as she has for many years now. Better yet though is that if you want to support bicycle advocacy in Oregon and do the ride you can become a member of the Bicycle Transportation Alliance and get into the Bridge Pedal for free (scroll down)! I’ve been putting off becoming a member for too long (actually, I want to become a member of Adventure Cycling and the Tandem Club of America, too, so maybe they’ll get me to do this with something similar.. hear me guys?? ), and this was just the excuse I needed. Also interesting, speaking of the BTA, is that Jim Wilcox is offering a donation to it with the purchase of any Bike Friday until November 1st. This is something he’s doing on his own, so if you want to take advantage of it, talk to him. Maybe that’s the impetus you need to get yourself a Bike Friday! Hopefully I’ll see you and yours at the Bridge Pedal!